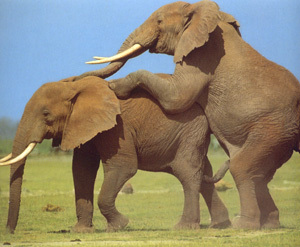 Elephant mating follow the normal mammal pattern. Wild elephants normally get a baby every 4-5 years. First comes the problem to house males, which is difficult. Males are much more dangerous than females, especially during the musth, an aggressive condition compared with male deer's rut. Some say, that for every bull in captivity, a keeper has been killed, and bulls can also injure cows. This has lead to special, expensive arrangements, as separate barn and enclosures for the bull. Formerly, bulls had often grown up on circuses with restricted female contact, and was sold or given to the zoo after they becAme uncontrollable, they often exposed general behavioral and medical problems. Today, most bulls in Zoos are kept in Protected contact conditions, which limits the acces to those bulls, and their care. They may suffer from foot-, and nail problems, or may have restricted contact with the group and the females, since they are impossible to control in interaction with the rest of the group. In many cases, the females are to old to get pregnant, and may often have unstable and disturbed eystreous-cycles, since female elephants not bred before age of 25 often get more and more "burned out" for every eystreous, and develop cancer in the genital area. They are also often unused to meet bulls, and lack social training in sexual courtship. There is always a risk that the female will undergo delivery problems, and die. There is also a high degree of stillbirths, or death during the first month. The females can be aggressive towards their calves and kill them, a problem that may be solved temporarily, if the cow is well trained, and can be watched by the keepers until she is calm and can be trusted. The first captive bred elephants in the western hemisphere were born on circuses. The very first was the male Joe born 31st f May 1875 at Howes Great London Circus (died shortly afterwords) and the second was the female Columbia born 3rd October 1880 on Cooper & Bailey Circus who was 27 seven years on her death 1907, the third was Bridgeport born 1882 at Barnum and Bailey Circus, all three elephants born in U.S. The first elephant born in a Zoo, was a stillborn calf born 1902 in London Zoo, but bred on Circus. In Buenos Aires Zoo, Argentina, the worlds first Zoo-bred surviving elephant was born 23 february 1905, and got the name Phua Victoria Portena. Unfortunately she died after three years. 1906 the two elephant babies M�di born in Vienna Zoo. and Editha born in Berlin survived, followed by Kaspar born in Copenhagen Zoo 1907.